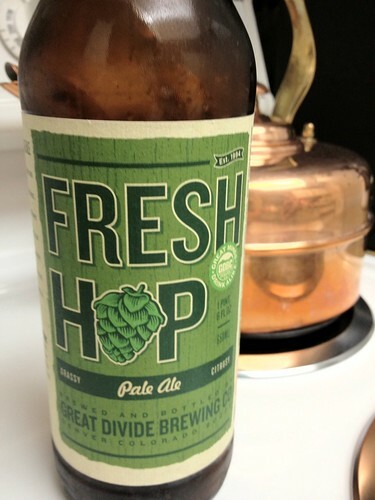 Great Divide Fresh Hopped Pale Ale, originally uploaded by adambarhan. Had one of these the other night and like the rest of the fresh hops around this year its delicious. Below is the rundown. Aroma: Pours a copper color with a two finger white foamy head on top. Nice retention and lacing left behind on the glass. Smell: A little bit of citrus and some pine. More caramel than expected. Some lemon in the front. Taste: More malt taste than usual. Lots of caramel with a little bit of lemon and a hint of pine. How it feels: Medium bodied with medium carbonation. Drinks pretty smooth, slightly dry finish. Not bad, but not the best of this years Fresh Hop’d brews . Will look for it next time it comes out though.